Fort Jefferson (1) (1846-1874) - Construction of this Third System fort began in 1846 supervised by the U.S. Army Corps of Engineers and continued for 30 years and was never completed. Named after President Thomas Jefferson. Located 70 miles west of Key West on Garden Key, Dry Tortugas Islands, Monroe County, Florida. Abandoned in 1874. Established to protect a critical point and as a base of operations in the Gulf of Mexico. The fort provided a safe harbor from enemies and weather. 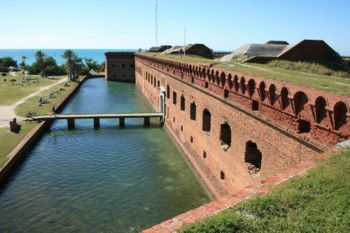 Designed as the largest Third System brick and masonry fort in the U.S. Fort Jefferson was to be a three-tiered six-sided 420 heavy gun fort, with two sides measuring 325 feet, four sides measuring 477 feet and bastions at each corner. Some 16 million bricks were used in its actual construction. 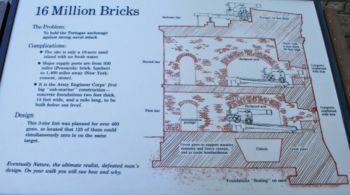 Prior to the U.S. Civil War the bricks came from Pensacola and were yellowish in color, during and after the war the bricks came from Maine and were red in color. The line of construction where the bricks changed can be seen at the very top of the fort Walls. The guns were to be mounted inside the walls in a string of 303 open vaulted casemates, facing toward the sea through large Totten embrasures, and along the top barbette tier. The third tier of casemates was never built. The fort depended upon rainwater as the only source of fresh water on the island and an elaborate system of cisterns was built into the foundations of the fort to catch and filter the rainwater. The cistern system failed after cracks developed in the cisterns because the foundations of the fort settled unevenly. The fort suffers from a lack of fresh water to this day. Soldiers and officers quarters, gunpowder magazines, storehouses, and other buildings were located on the interior parade. A three-story, 1000 man barracks dominated one side of the parade while a set of officers' quarters was built on the opposite side. The main magazine and a secondary magazine were located adjacent to the northeast and southwest casemates. A hotshot furnace was located behind the main magazine. The Army employed a variety of civilian contractors, paid laborers, military convicts and slaves to construct the fort. 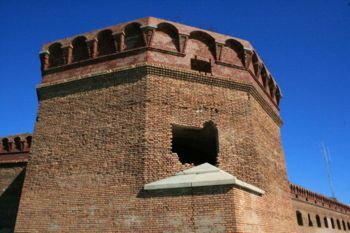 This fort, like all the other Third System Forts was made obsolete by the adoption of large caliber rifled cannon that could penetrate the brick and masonry walls. The destruction of Fort Pulaski by Union batteries in Apr 1862 signaled the demise of the Third System Forts. During the U.S. Civil War the number of Union military convicts increased so significantly that slaves were no longer necessary. 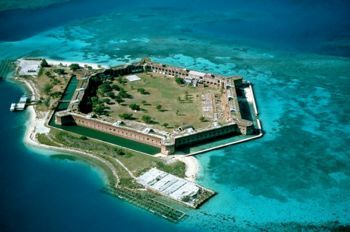 The peak military population of Fort Jefferson was 1,729 and the total population of almost 2000 with military dependents and civilians. 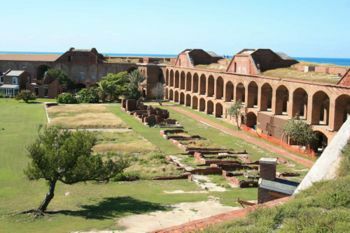 After the U.S. Civil War Fort Jefferson was used as a Federal prison and housed the famed convicted conspirators of the Lincoln assassination including Dr. Samuel A. Mudd. 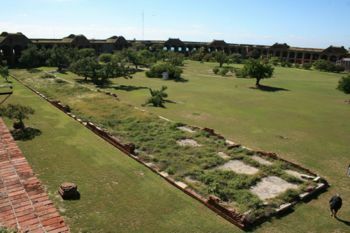 Fort Jefferson was abandoned in 1874. The park is staffed with about a dozen park rangers who live year-round in accommodations built into the casemates of the fort. Access to the island is provided by commercial boats and seaplanes based in Key West. Location: 70 miles west of Key West on Garden Key, Dry Tortugas Islands, Florida. This page was last modified 10:21, 16 April 2019 by John Stanton. Based on work by Bill Thayer.